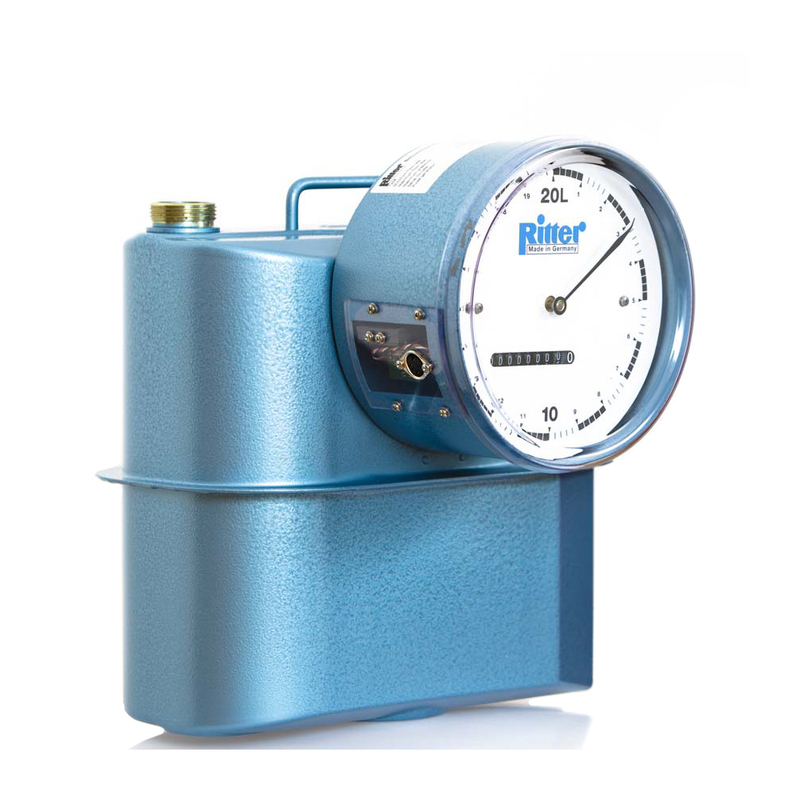 RITTER Bellows-type Gas Meters are applicable for measuring the volume of flowing inert and dry gases and are particularly effective at high gas flows. Please note that gases containing aggressive components may reduce the life span of bellows-type gas meters, if the casing of the measuring unit (tinplate), the valve/control elements (polyamide) or the bellows (Perbunan®) should be attacked. The desired measurement range can be selected from among 6 magnitudes (types) extending together as a whole from 40 ltr/h to 160 m3/h at a gas temperature ranging from +5 °C to +40 °C. The solidly soldered casing on the standard model is designed to withstand a maximum overpressure of 50 mbar (BG 40/100: 0.5 bar). The measurement principle and the design of the measuring unit enables a measuring accuracy of ±2%. Please note: The flow direction cannot be reversed. The measurement of RITTER Bellows-type Gas Meters works on the principle of displacement. The Gas Meters contain a twin-chamber measuring unit with a flexible bellow within each chamber. Thus, a compulsory measurement of the gas flow is possible when these chambers are periodically filled and emptied. The design of the measuring chamber is such that the measuring volume per cycle of the bellows is constant. Because of the measurement principle the actual volume is measured. The movement of the bellows is caused by the pressure difference between inlet and the outlet of the meter. The periodical filling is controlled by means of two sliding valves. The oscillating movement is transformed into a rotational one and is mechanically transmitted to the counter through a magnetic coupling. The major advantage and the superiority of volumetric gas meters (like bellows-type gas meters) over other measurement principles, which determine gas volume using secondary measurable variables such as speed, heat capacity, hot-wire resistance or similar, is that the volume is directly measured by the principle of displacement. That means that the condition and the composition of the gas has no influence on the measurement accuracy. Correcting factors which take into account gas type, temperature, humidity etc are therefore not necessary. It should be noted that with other, non-volumetric measurement processes, the measurement accuracy given for that process can only be achieved if the correcting factors for the immediate condition of the gas are exactly known. The RITTER Bellows-type Gas Meters need no maintenance and no set-up prior to the measurement. They are easy to carry, don’t need a power supply (unless equipped with option Pulse Generator) and can therefore be used in the field as well without problems.